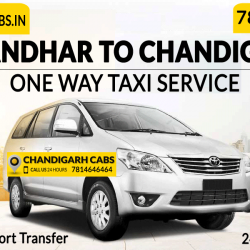 One Way Taxi From Jalandhar To Chandigarh pickup from Jalandhar ISBT, Jalandhar Railway Station. Book Jalandhar To Chandigarh Airport Taxi by Call 7814646464. We provide best taxi service from Jalandhar To Chandigarh. Our Cab service is available 365 Days and 24×7 anywhere from Jalandhar City, Jalandhar Cantt, Phagwara, Phillaur and as well it’s around locations also. Jalandhar is a district of Punjab State and it is famous for its great sports goods.